Mikal Bridges is a top 5 pick in this draft. Reminds me a little of Luol Deng. There is no way the Bulls should pass up on him if he is available at 7. Bridges over Porter any day! Sam: All I know, at least based on my mail, is the Bulls can only get this wrong, at least until sometime during next season, and likely beyond. Actually, you're in the minority on this one with the most demands from fans being for Porter Jr., the Missouri boom or bust guy. Though the big risk is only for the team; those making the suggestions, like fans and media, get to say if he cannot bend down in three months, “Oh, well, I guess I was wrong. What did the Cubs do today?” Bridges, I'm sure, is high on their list, and based on the way the draft seems to be breaking down, at least preliminarily, I agree with John Paxson that they should add a good player. I doubt any of the top three teams trade out, but Memphis at No. 4 could. With Mike Conley coming back and if they don't trade Marc Gasol, I can see them looking for a more experienced player. But, no, I don't see tremendous value trying to give up something to move from 7 to 4. OK, if someone wants 7 and Antonio Blakeney or Paul Zipser. But it cost Philadelphia a potential top five pick for next year to move up two spots last year. You're not moving up with anything less than one of your starters. The good ones. It seems clear the first tier is three, and then the next group is pretty much four through 10 depending on your interest in a big man or a wing. Thus the dilemma, in part, for the Bulls. They also need a center with Robin Lopez entering his final session and Cristiano Felicio not a starting level player. The draft big men, like Jaren Jackson, Mo Bamba and Wendell Carter, seem sure starters in the league for the next 10 years, Bamba the Rudy Robert guy and Carter the Al Horford. And the Bulls have no real shot blockers or rim protectors since Markkanen really isn't that kind of big man. But Paxson also pretty much described Bridges—though there's also interest in the Michigan State Bridges—when he spoke generically about team need and league requirements in this era, a wing player who can shoot from distance and defend. Bridges is probably more athletic than Deng, and Deng was a very good choice. Decisions decisions. 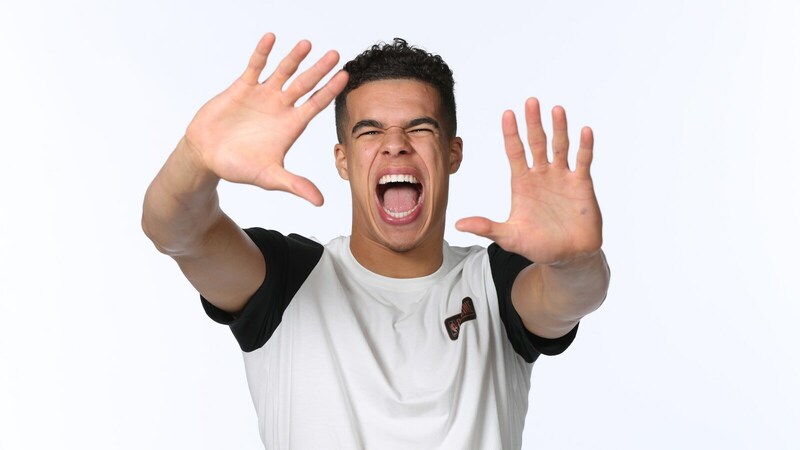 I pray MPJ (Michael Porter Jr.) is gone by 7. MPJ is a big risk. I say Carter at 7. Sam: OK, not everyone wants Porter. Carter seems a safe, secure and valuable type player, a hard working team guy. Just look at the Duke situation where he was there to back up Bagley and do the dirty work without worrying about the acclaim. You see comparisons to Al Horford and Juwan Howard, who were All-Stars, albeit briefly and in Horford's case apparently the last one picked this past All-Star game with the captain's picks. But he sure looks valuable against the Cavs in the conference finals. I remember talking to GMs from Horford's draft after the interviews who said he was one of the most impressive people they'd ever met in basketball. This could be what the Bulls face in matchmaking terms if Porter is available along with Carter: Do you select the guy who might be the most physically appealing without knowing the personality, behavior and values? Though they might be ideal. Or the one you know is an excellent fit, if not quite that potentially exciting. Go for the jackpot in Vegas and maybe bust out? Or know you're going home with a nice profit and a smile on your face. Though maybe not enough to retire. 7 isn't bad in this draft! I'm sure some fans are mad they didn't do an all out tank and some are probably still crying about Jordan Bell. I think there are 7 solid picks in early lottery: Ayton, Doncic, Bagley, Bamba, Jackson Jr, Young and Porter Jr. Bulls have enough 4 and 5's so hopefully Porter Jr falls to them or Doncic? Ha ha. Porter Jr is not bad at 7. If he's healthy. I remember the Bulls passed on Brandon Roy because they knew it was just a matter of time before he was bone on bone in his knee. If they see the same with Porter Jr and his back, they'll probably pass. Either way, they'll get a good player at 7 and at 22. Maybe a JR/SR at 22...Hutchinson, Milton or even Trent Jr would be nice. They really don't need to get any younger though. 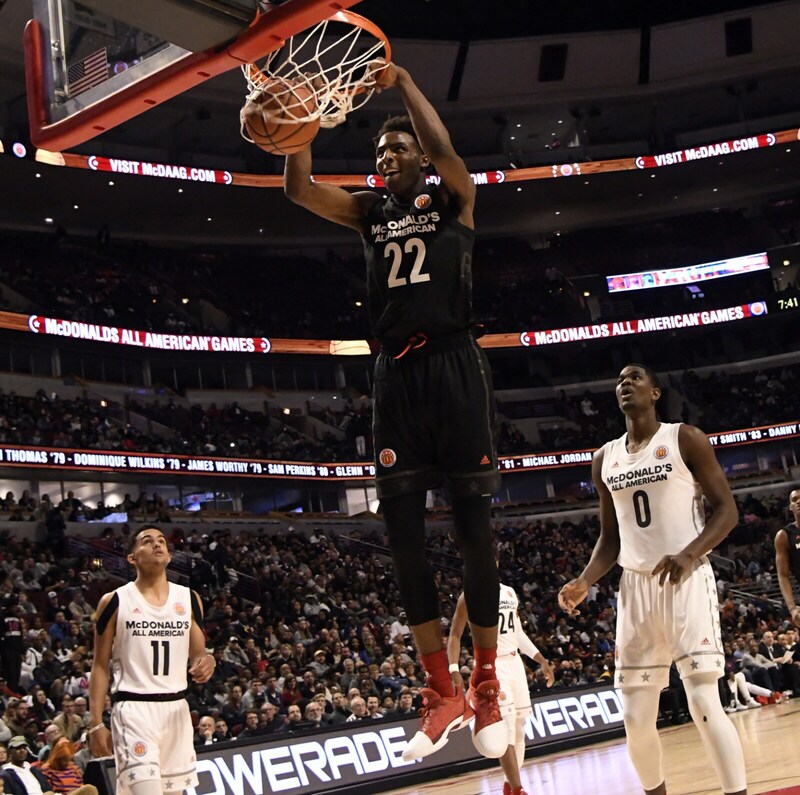 Bulls will probably draft Mikal Bridges. Not bad but if they do so while passing on Porter Jr, leaving him for the Cavs, that'll upset me. Sam: Many believe Porter will be taken before the Bulls select at No. 7. If his physical is positive, and he did return to play late in the season, and then he has some good workouts, which seems likely the way he can shoot the ball (and no one scrimmages in these team workouts), he could become hot again and could go as high as No. 4. And now Doncic is making noises about staying in Europe after being linked to the Kings. Maybe he doesn't know there's an In 'n Out burger right near the arena. If Porter slips to No. 7, then the assumption is someone flew a red flag about him. But here's the big dilemma for a team like the Bulls: It's almost impossible to get a big time impact player; so in what they hope is their last time in the top 10 of the draft, do they take a risk on one? If it doesn't work, they blew an entire season. If they select one of the big men who could fall to them like Bamba and Carter or one of the Bridges, they'll probably have a starter for years. After the top five assuming they get there, two players who look like they have star potential are Porter at 6-10 for his all around offense (and projected as the No 1 pick before the season) and Trae Young, who perhaps can be the shooting and passing threat that an uptempo game like the Bulls wants to play requires. Maybe he's not Steph Curry, but maybe he is Steve Nash. Those are transcendent Hall of Fame thin, little guys. Curry, as we know, was taken No. 7. The Bulls have three players in Markkanen, LaVine and Dunn who look like they'll be very good. They're not starting at the bottom. So take a high ceiling risk? Or because they have three good young players and one could emerge as a star, why not fill in around them to complement and support what they do and keep adding talent? There's no right answer, but they are expected to get it right. Tough spot. Ignoring whether it would be a good trade or not, under the trade rules, would it be feasible to sign LaVine to a reasonable contract and then trade LaVine and the 7th pick to Sacramento or Atlanta for 2nd or 3rd pick to get Bagley or Doncic? Just curious. Sam: No. For many reasons. LaVine cannot sign until summer and the No. 7 pick while nice is hardly in great demand, LaVine is coming off ACL surgery and unable to finish the season with knee tendinitis (though we think he could have played under other circumstances) and the top 3 in this draft are untouchable unless you offer an All-Star. That should satisfy your curiosity for awhile. I'd rather be the Kings than the the Suns. Hear me out. It's well known that Vlade loves Luka. Suns have a tough decision. Take the college hometown star Ayton or take the new coaches main guy in Luka. Vlade wants Luka but will gladly take Ayton. Meanwhile, Cousins unfollowed the Pelicans on social media. Could mean something, could mean nothing. If i am Pels i let him walk. Coming off a bad injury not to mention hes a ball stopper and a team morale killer. Sam: I expect them to take Ayton, but I see many mock drafts still having them taking Doncic. Which maybe is what Doncic is angling for with his threats to leave this draft. Many say the Suns would not have hired Doncic's coach if given a chance they won't take him. Trade down? It's going to be difficult for the Suns to pass on a guy that big and skilled in the Embiid category. And while NBA executives like Doncic, pretty much all say if you don't play him as your point guard/forward with the ball in his hands he becomes a pretty average player. The interesting part may be if, as you say, Vlade wants Doncic what would they do with De'Aaron Fox, who got them the pick at the lottery. Well, not actually, but he was on stage at the ESPN show. Fox could prove attractive, though the way they've been building their team with additions of Vince Carter and Zach Randolph, you figure they'd make a run at Dwyane Wade and Udonis Haslem. DeMarcus back to the Kings? Got to love social media. Whatever it is. At No. 22, there are a lot of guards available, but aside from the lottery only one big man Mitchell Robinson is available and he will likely slide 16-19. The rest are guards such as Zhaire Smith, Lonnie Walker, Gary Trent Jr., Anfernee Simons, Troy Brown, etc. There is one small forward out of Bosnia, Dzanan Musa whom is getting some applause. I'm not sure that's what the Bulls need, nor do I think the Bulls will benefit from a two guard such as one of the names above when you already have a clutter of young guards who are expected to get minutes. Sam: In other words, next player available on their list. No aiming for position. But unless the Bulls invest in free agency this summer, which there has been no great indication about, they're going to be even younger and more inexperienced next season with two more rookies and possible teenagers from the draft. Sam: It is possible because of LeBron; after all, Jordan was down 0-2 in the conference finals in 1993. And then the Bulls went home and won the next two and four straight. Against probably a better team than the current Celtics. But the problem for LeBron was the same one that had us all saying this was the year he'd lose before the Finals. Because he had no sidekick. Especially a sidekick who could make plays. Then Hill awoke for a few games while the Raptors had taken that early vacation and maybe they had that second guy. Until we recalled that George Hill is either hurt again or about to be. Boston has played LeBron the right way, which is the same way the Bulls always played him and had a lot of success (other than after the first game of playoff series). You let him score. Take as many shots as he wants. Go under screens, don't switch. Play up on the guys standing around waiting to shoot, make their shots difficult. The difference was LeBron once he went to Miami always had a second playmaker, first Wade and then Kyrie. You want LeBron to go for 40. Because he can't score 100. Boston isn't doing anything everyone else hasn't done; when LeBron didn't have that second playmaker he was swept the one time he went to the Finals and basically gave up in losing to Boston in the conference semifinals and then leaving. Boston's not great, but the Cavs are more than in a hole; they have a big hole. Isaiah Thomas was supposed to plug it; but as many feared, he slipped down the drain. Apparently, Brad Stevens does not allow rookie hazing in his team. The rationale behind that is he wants his rookies to be as empowered as everyone else. With the success of Tatum this year and the rise of Brown towards the end of the year last year, do you think other coaches will give this approach a look? Sam: I hadn't heard that and am not sure the point since I rarely ever see any rookie hazing in the NBA. Guys come in with entourages, making more money than many of the veterans. Eddy Curry had a dozen cars. Well, that was not such a good idea, so OK, guys may bring in donuts in the morning, which is sort of superfluous since just about all teams have a restaurant in their practice facility these days. You used to see a rookie occasionally wearing one of those Dora the Explore backpacks, or something like that. But I don't see any players ever carrying luggage around and these days, as John Paxson noted in talking about the draft the other day, rookies come in expecting to start or play a major role. I really don't recall Michael Jordan undergoing any hazing. Other than perhaps not getting paid a few times when he won every scrimmage. 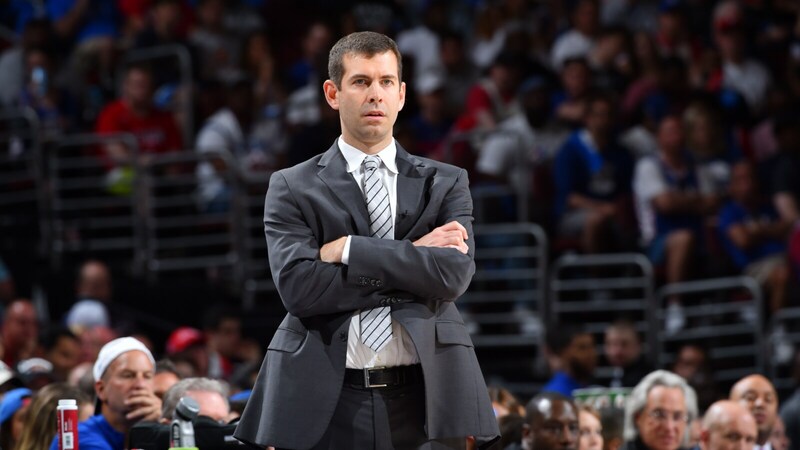 I think Brad Stevens does a very good job and hardly seeks out attention. He seems like a bright, classy and competent guy. But this cult of genius being placed on him by media is a bit much sometimes. He's got the most very good players. 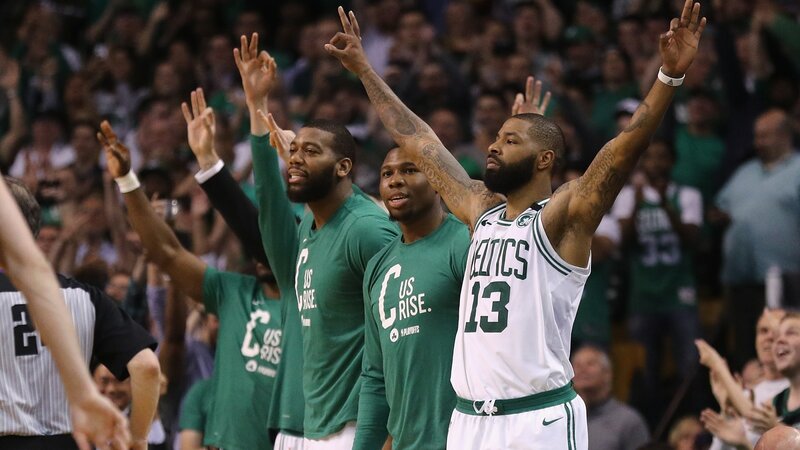 Thus far in every series not the most famous or the best one, but more good players up and down his roster than any of the Celtics opponents. Even without Irving and Hayward, he's playing six lottery picks—four selected in the top six—and Terry Rozier, selected two spots out of the lottery. Who else has that? There's a lot of disappointment among Bulls fans in the team's landing the #7 pick in the upcoming draft, myself included (albeit the Bulls had less than a 20% chance at improving to the Top 3, so it should serve as no surprise). These Bulls need a franchise player that statistically, they're far less likely to find at #7. That said, unless the Bulls make a huge splash in free agency this summer, we can reasonably expect a 30-40 win season next year, placing them among the better teams to miss the playoffs. Normally this would result in extremely low odds to win the draft lottery and a likely 10th or 11th pick. However, under the new lottery rules, these less probable franchises will see improved odds. So I suppose there's some cause for optimism in that respect, right? Who would you like to see the Bulls draft at 7th? Sam: Yes, if the Bulls finish in the sixth spot like this season, they'd have a nine percent chance for the No. 1 pick instead of this year's 5.3. No, probably not worth going through the machinations of this season again. The change gives the three teams with the poorest records each a 14 percent chance for No. 1, down from 25 percent for No. 1 and 20 percent for No. 2. But commissioner Adam Silver already has realized that won't work enough and too many teams again will be trying to lose. The NBA has reached the point of peril. Fans now are criticizing teams for not being able to lose enough. When that starts to happen you can see the end of the credibility of your sport. I'd expect in the next few years a major system change in which you might have the same odds 1-14. So you could go 10-72 and end up with No. 14. Too bad. So try to win. That's what everyone was supposed to be doing. 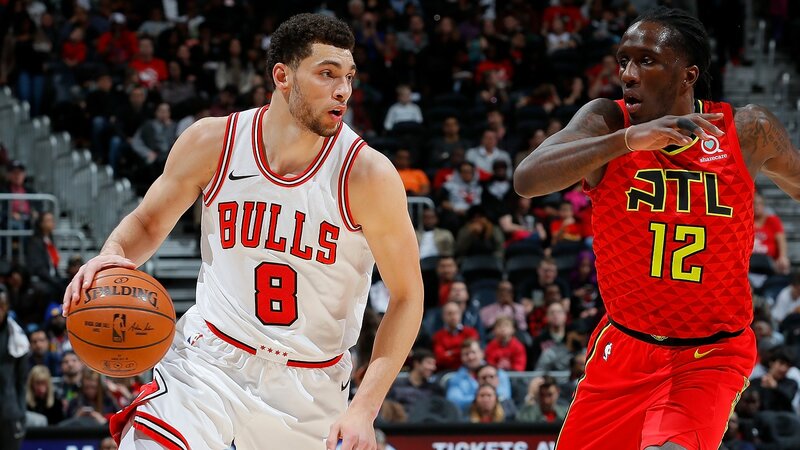 It seems to me that shoot-first, undersized points usually end up coming off the bench for 20 minutes a game, and the Bulls might want to shoot for more potential with #7. On the other hand, if Young has the quickness and acumen to develop into a distributor like Nash, he could be a difference maker for someone. I expect Gar and Pax will make a good pick at #7. They've been very solid for a number of years at getting value wherever they draft. If they have a choice between Porter and Wendell Carter, I wouldn't be surprised if work ethic was the deciding factor. Sam: That's the worry about Trae Young as well as Collin Sexton. They are both really small. Really small can give you some excitement, like Nate Robinson and Isaiah Thomas, but eventually they're in every pick and roll and you're trying to get them off the court. It's why I think the leader in the clubhouse now for the Bulls is whichever big man who falls because the top talent in this draft is among the big guys. Sam: Many did. Interesting that I saw Elton Brand at the lottery as he works for the 76ers now. We were talking about his trade because he always kids with me about advocating for it. That's not exactly true as I wrote at the time the Bulls were surprising the league in discussing trading him. Krause—and he wasn't wrong—decided you could not win a title with Brand, averaging 20 and 10 his first two seasons, as your main player. So he decided to cash in for two kid seven footers who he described as Shaq-like (Eddy Curry) and Garnett-like (Tyson Chandler). It proved out more like Charles Shackleford (Charles Barkley upon the 76ers acquiring Shackleford famously said ‘I told them to get me Shaq. Not that one!') and Bill Garnett. Though Chandler did eventually grow into a great defensive center. Krause's theory was right in an East losing all the great big men with Shaq going west, Ewing retiring. But it cost Krause his job. Brand told me the other night he thought the Bulls with Artest and Jamal Crawford had a good roster and could eventually get to 50 wins. Krause decided that was the problem. I have no problem with that. I know many in media and fans view teams as tanking or a championship. But it does't work that way. You have to get there and then you never know who you might add. Yes, stars become available. And Kawhi Leonard might be, and Markkanen and 7 might get it done. But I wouldn't do that for a player out the last year without much explanation. Markkanen turns 21 next week and Leonard is 27 next month with a lot of question marks. Now if you can do the equivalent of Kevin Martin, Jeremy Lamb and a pair of mid level firsts as Houston did for Harden, I'm on board with that. Well, we'll see what happens Wednesday. If D'antoni is half the coach you think he is, there should be some adjustments & surprises. But that's not what he and his players are saying. “We are what we are. We won 65 games playing iso, why should we change?” I think they mean it, and I think (once again, sorry) that D'antoni cannot win a championship, no matter how much talent he has. You need more balance, and you need defense. I'm thinking Warriors in 5. Sam: Speaking of those Celtics, actually what they also are doing is giving everyone else in the East hope. Yes, they have a lot of talent, as I mentioned. They've been the story of the playoffs. But they are doing this without a transcendent star. Or really even an All-Star. OK, Al, but he was picked last. The point is you don't always need that superstar to have a great team you can be excited about and can do some things. Of course, you'd like to have that star if you could, but there really aren't enough to go around. So then give up? No, maybe use No. 7 for another good player. That's basically what Boston has been doing. That's why their next man up thing works so well. The Bulls were trying it with Nate Robinson, Daequan Cook, Ronnie Brewer and Nazr Mohammed. There isn't a single player in the playoffs for Boston around whom you could build a team in the traditional sense. None can be counted on to have a big scoring game every game. None have. But they all come to compete, play hard, defend, sacrifice. That's always been the sort of teams the Bulls under Paxson try to build; other than when they fell into a superstar in Rose. They could build that sort of team now by not taking a risk in the draft and adding a hard working big man or wing. One or both will be there without superstar potential. Boston has been showing you can succeed with a lot of talent; not necessarily superstar talent. Houston did get that second game as I got your email before it. I don't agree with that that narrative about D'Antoni cannot win a title. His players haven't been able to, though I always believed with Nash and Stoudemire they'd have won if the league hadn't suspended all their guys after Robert Horry's attack on Nash. This Houston team is not the way D'Antoni plays. He's not inflexible. He's just had to play this way because it's who he has. That's what good coaching is about. He's a moving/isolation guy, if I can say that. Steve Nash wasn't standing around. But they stuck him with Harden and Paul, who both dominate and hold onto the ball. His Phoenix teams didn't play this way. But he's adjusted to what his players do best. Plus, he has plenty of defensive guys and uses them. Check the matchups in this series. Your prediction is reasonable because Golden State is better at every position. Curry is better than Paul, Durant is better than Harden, and then Thompson and Green are better than any two other Rockets players. So Golden State has at least four of the best starters and I'd probably take Iguodala, also. Sure, the Rockets won a lot of games. I won't say it's coaching because they have very good players; just not so many in a match up against the Warriors.